An intense drama of friendship, rivalry, antagonism and passion. All for the love of the game. Based on the best-selling comic book series that sold well over 30,000,000 copies in Japan alone. He was the one who convinced remaining players to play basketball again. Mutsumi had once said that it was as if Aikawa reminded them all about how much fun they could've all had playing basketball together. He was once the trump card and captain of the Tendōji High's basketball team. He plays the position of point forward in the team. He also has a knack of being able to jump higher than most people, and that makes up for his height disadvantage. He is considered to be a genius as can be seen in anime and it is seen that his skills seems to improve with every game that he plays. He is also the best friend of SAWA,The star player and point guard of Tendōji High School,and his friend call Steve and Steve is Power Forward. Fujiwara is a second-year student at Mizuho High. He is often nicknamed as Taku by his close friends and seems romantically involved with Mutsumi Akiyoshi of the girls' team. Fujiwara also appears to be very close to his long-time friend, Miura Ranmaru. He was involved in an incident where he was provoked into punching the coach in his first year. The coach has since transferred to another school and Mizuho's boys basketball team was banned from any tournament for a year. He is not to be mistaken with Initial D's Takumi Fujiwara. He has an old injury on his right knee which came from one of his games involving Miura and was ordered by Anzaki to rehabilitate his knee and make it more flexible to improve his playing ability in time for the prefectural tournament. Fujiwara is the captain of Mizuho basketball team and plays the position of point guard. He attended Mizuho Junior High and was Miura's teammate at that time as well. As seen in the anime and said by Aikawa that he(Takumi) is the reason due to which Aikawa can push himself way beyond his limits. Miura has a calm and quiet personality. He appears to be Fujiwara's best friend since middle school. Miura was seen not to have good stamina at the beginning of the series. He plays the shooting guard position and is the three pointers of the team. It was mentioned in the manga that he would rather be scoring points then being the playmaker of the team.He is also talented at stealing balls from his opponents. He is also the one who can shoot Fade Away Three Pointers. During the match verus Kadena Nishi, he is forced to shoot NBA 3 pointers to help Mizuho win the match. Unfortunately, he was injured due to a foul made by Kenta Shimabukuro. He was then rested for the subsequent match. Miura attended Mizuho Junior High and was Fujiwara's teammate at that time as well. He blamed himself for causing Fujiwara's knee injury although it is not his fault. In the anime, Keiko Ogami of the girls' team seems to have a crush on him. Fujiwara had intended Miura to, before the start of tournament, become a player to be feared. He wants Miura to like before, be unpredicatable with his pin point passes, judgement and sharp shooting. Ishii is an extremely short-tempered person. It was highlighted that his weakness is being easily provoked by the opposing team to foul, and is prone to commit four fouls at a crucial time of a match. However, as the team starts to advance to the final, he has grown mature and his skills were also starting to grow more steady and powerful. He plays the position of power forward in the team. It appears that he and Dobashi are close friends, having played on the same team during middle school. Ishii attended Takakura Junior High. Dobashi is the largest on team. He resembles Miura and has a quiet personality. Although his legs are not strong, he proves to his teammates that he can steal, rebound and defend better than ever before. He plays the position of center in the team. He is often called "old man" by Ishii because of his hair and appearance. In the anime, before the prefectural championship, he changed his hairstyle. Dobashi attended Takakura Junior High. As the story passes, he was one of the pillars for the team and his presence is felt. Whenever he was injured, the team performance will fare badly because everyone expects him to be there being the main guy in defence. 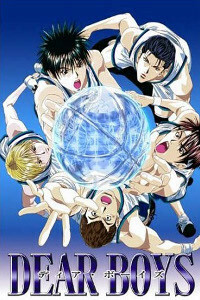 Takashina is first seen practising alone in one episode, and later became the 6th member of the boys' team. It was said that he can play any position in a team. He is extremely talented in shooting three-pointers, matching up to Miura's level of skill. It is said that Takashina was a friend of Ayumi Fuse during middle school. Mutsumi is the captain of the girls' basketball team, and is a close friend of Moritaka's. She seems to be romantically involved with Takumi Fujiwara of the boys' team. She plays as a point guard on the team and used to admire Fujiwara's talent. Mai seems to be romantically involved with Kazuhiko Aikawa and becomes his girlfriend later in the series. Aikawa nicknames her "Pony" because of her long ponytail-like hair when he first saw her. Her position on the team has never been revealed, neither in the manga nor in the anime. However, after some advice and personal training from Aikawa, Mai has the highest shot percentage among all her teammates when it comes to 3-pointers. Keiko plays as a center for the girls' team and is the tallest among all her teammates. She appears to have a crush on Miura and is proven on two occasions: one when she gave Miura a 'victory sign', and another when Mutsumi remarked if Keiko would get jealous after seeing a couple of girls approach Miura to congratulate him over the team's recent victory. Satomi knows Fujiwara and Miura from middle school and is the manager of the boys' team. Currently, she studies at Mizuho High. She used to be active in basketball, but due to an injury she obtained, she is now unable to do so.She seems to be very close with Tōya Takashina who is her classmate. To Satomi, taking the responsibility of being the team's manager is a new way of contributing to the sport she loves. Miss Himuro is the coach for the Mizuho High girls' basketball team. However, when the boys' basketball team is reformed, she becomes the coach for both teams. She comes off as an extremely strict coach, but is actually very fond of her 'Dear Boys'. In episode 7, the premelinary round for the girls' team is approaching and she wants to focus on the girls. As such, she appoints Satomi Anzaki to be the manager of the boys' team.